Are you are looking for the perfect escape that is unique and a little bit different? Then the Pevensey Bay Beach House is absolutely the place for you. We offer a luxury break, ideal for good friends and family. You can take pleasure from the expanse of the sea and the South Downs – winter or summer. Plenty of local great pubs for visiting after a brisk country walk. Vast range of local independent food providers for you to cook up a storm. Range of activities suited for your mood, so you can be as lazy or active as you feel. We welcome dogs and want them to enjoy it as much as you do. 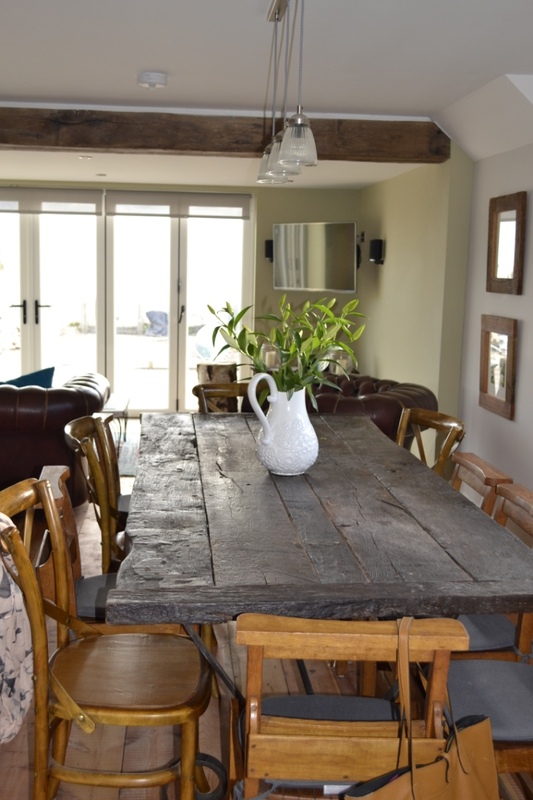 If this appeals to you, contact us, we'd love to welcome you at the Pevensey Bay Beach House. 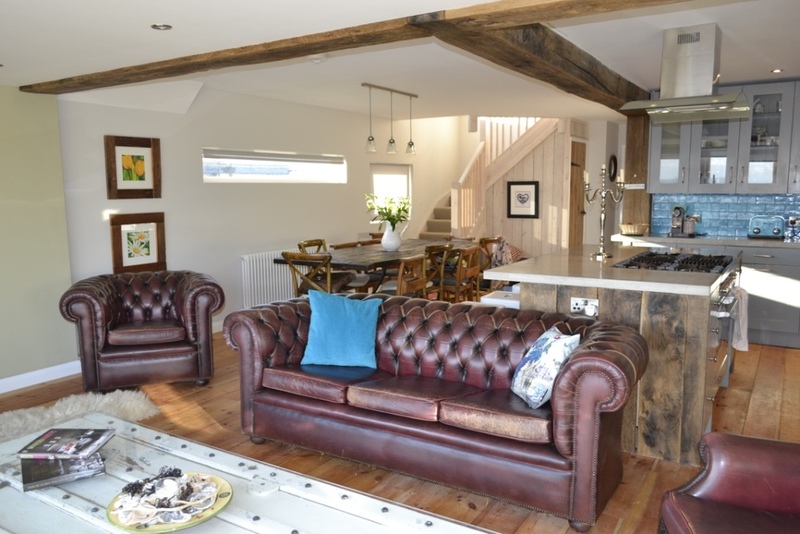 Located at the site of the Norman landings and in the heart of 1066 country, the Pevensey Bay Beach House is a newly built 4 bedroom pet friendly luxury holiday let built directly on the beach in East Sussex. As you can see from the photos, we have worked hard to make sure that the fantastic location is reflected in the layout of the house whilst ensuring it is not your average run of the mill beach house let. 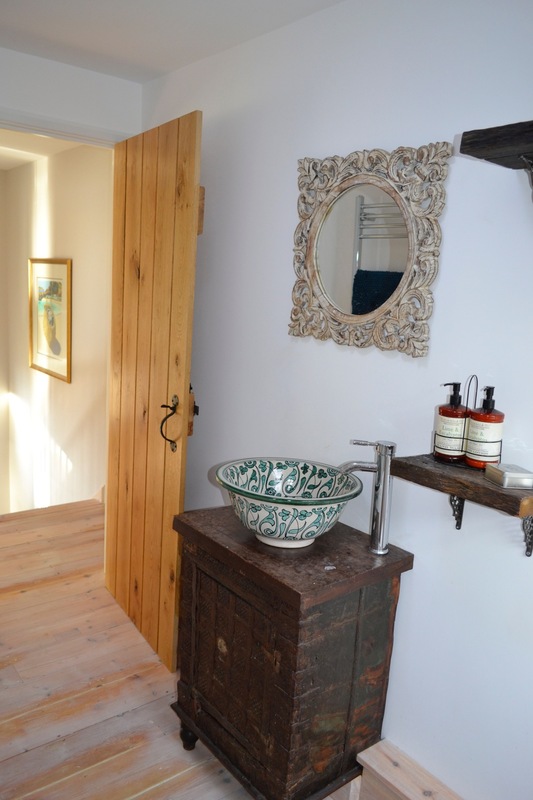 The pacious Pevensey Bay Beach House has chic and quirky features like the use of old groyne oak, Chesterfield furniture, reclaimed floor boards, concrete kitchen bench tops, Moroccan bowl sinks, antique french beds, contemporary colours and penny coin floors. Downstairs features a large open plan living space and cooks kitchen with a double Britannia oven, Siemens fridge and dishwasher, and large center island overlooking the dining table capable of seating 10. Deep Chesterfield sofas and chairs, and high spec sound system [including cable TV, Sonos, WiFi and Smart TV] occupy a large portion of this area all of which opens onto an expansive terrace through massive bifold doors opening onto the large terrace and out to the sea. The balance of the downstairs space is made up of two bedrooms - one with a beautiful French queen bed, and the other with a full sized bunk bed - together with a large shower room and utility area. The second floor has two very large bedrooms and bathroom with bath and shower. The spectacular beach side bedroom has a king sized cast iron bed and opens via french doors on to terrace overlooking the beach with views from Eastbourne and the South Downs National Park around to Hastings and all in between. The second upstairs bedroom has a queen-sized bed as well as a double bunk bed [ideal for either two, mixed groups, or as child or teenage den] with views over the countryside towards Hertsmonceux. The very comfortable beds feature down filled mattress toppers, Egyptian cotton bed linen and feather duvets and pillows. Bathroom towels are provided. The owners have a large Labrador who loves the sea so have made sure access to a warm outside dog shower is available for those chilly days, the entrance has an area to towel pets down and the wooden floors are ideal for those residual wet feet. The property is fenced should the lure of the sea prove too much for our four legged friends – or equally adventurous two legged rascals! Take the M23 to Brighton and follow the A27 through to the A259 to Pevensey Bay. The Pevensey Bay Beach House is an hour and 10 minutes from the M25 / M23 junction. 1066 country is well service by a number of alternative routes including the A22 via East Grinstead and the A26 from Royal Tunbridge Wells. Southwest Trains run a regular service from London Victoria via Clapham Junction to Eastbourne and on into Pevensey Bay. Travel time to Eastbourne is circa 1 hour 30 minutes. Trains also run from Brighton through Lewes and into Pevensey Bay. The nearest airport is Gatwick that is an hour by road to the house. Newhaven is a 30-minute drive away with a regular ferry service to and from Dieppe. East Sussex is part of the historic county of Sussex, which has its roots in the ancient kingdom of the South Saxons, who established themselves there in the 5th century AD, after the departure of the Romans. Archaeological remains are plentiful, especially in the upland areas. The area's position on the coast has also meant that there were many invaders, including the Romans and later the Normans. This historic past, married with the region’s activity, cultural, and food and wine rebirth means there is a wealth of variation for all. There are a number of wonderful historic towns within a short drive from the peace of The Pevensey Bay Beach House. Pevensey Village is home to Pevensey Castle began in the 4th century as one of the last and strongest of the Roman 'Saxon Shore' forts, two-thirds of whose towered walls still stand. It was the landing place of William the Conqueror's army in 1066. During the century after the Conquest a full-scale Norman castle, with a great square keep and a powerful gatehouse, was built within one corner of the fort. In the 1250s the towered bailey wall was constructed, and soon put to the test during the great siege of 1264. Not too much further away you will find Hertsmoceux Castle has its origins in the 12th Century and was the former site of the Royal Greenwich Observatory. Many of the towns and villages in the local area have bags of character and history, great bars and eateries and many attractions for all including local markets, shopping, historic tours, pier fun grounds, fishing charters, sporting facilities etc. For more information and to book your stay at the Pevensey Bay Beach House, simply click here and select the prices tab within the new window. 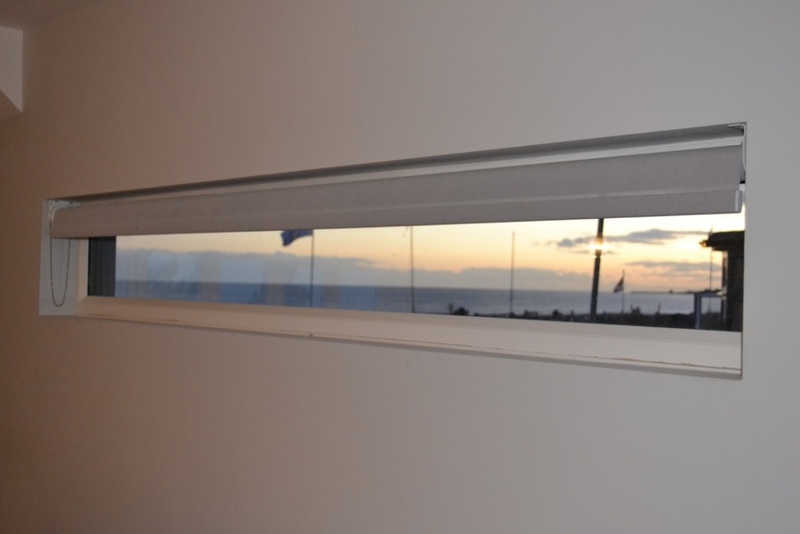 "We all felt a real sense of well-being during our stay in this superb Pevensey beach house. The decor and structure of the house were imaginative, and I loved the light that streamed into the house from various well-placed windows. We had the doors flung open most of the day but I can imagine being just as happy nestling in with a fire in the stove looking out at a storm. We have stayed twice now, and each time we leave, a little 'peace' of Pevensey seems to come back home with us. Bliss!"